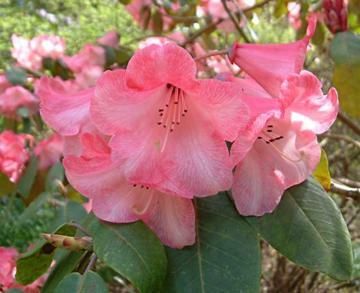 Large, evergreen shrub or small tree of open habit, producing lax trusses of bell-shaped, waxy, rose-pink flowers with darker shading on the outside, in early to mid spring. Grey-brown flaking bark. Hybrid of Rh. griffithianum x Rh. thomsonii, raised at Penjerrick, Cornwall.